Back in August, a friend of ours decided, for various reasons, they could no longer care for their recently adopted dog. Having met him and already aware of his issues, we decided to take him in until we could find him a permanent home. That is how we came to be short-term beagle owners. 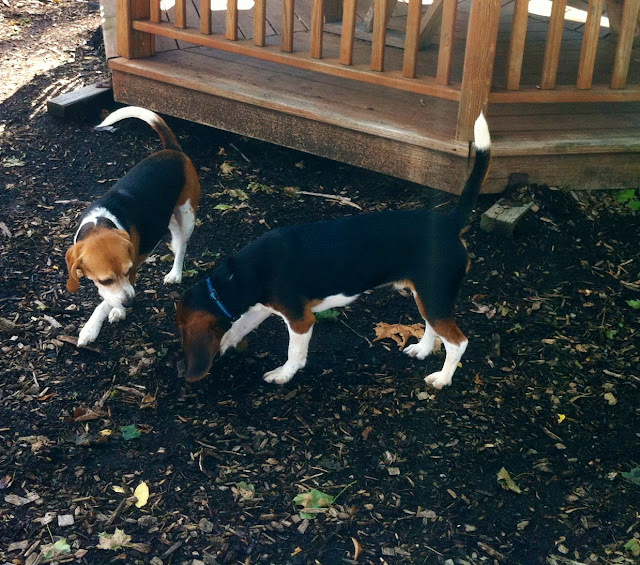 Toby, a young (9 month-ish), said-to-be pure bred beagle, came to live with us in August. At that time, he was scared of everything, not housetrained, and did not walk well on a leash. We promptly began training on Day 1. After a good ol' fashion neutering, of course. Here's Toby doing his version of "down-stay." He didn’t come without his issues of course (the crate...yikes! ), but he was such a sweet little guy. All he wanted to do was be with his people and pal around with his two new buddies. We were diligent about searching for his perfect home. We created a facebook page for him, put up fliers at all the shops in town, and carried info cards on us at all time for perspective adopters. In September, we were contacted by potential adopters who were looking for a playmate for their 5-year-old beagle, Abbey. It’s been 3 months since Toby was adopted. 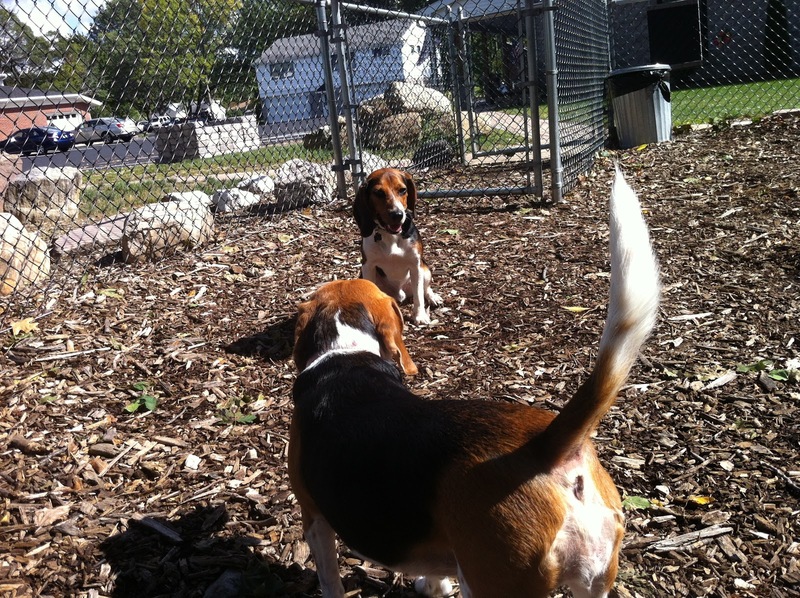 We think of him in his new home every time we hear see a beagle. Toby is living the life of luxury with his new family and his beagle sister. This weekend, Tess & Ed were busy getting the house ready for the holidays. They helped pull up the old, ugly carpeting in the living room and dining room, and inspected the walk-ability of the hardwood. Edison even helped make biscotti. And helped clean up after! Tesla showed no interest in helping. Until they thought an ornament was a treat! These went up high to eliminate the confusion. Posing with Edison’s our creation. After all that hard work, Edi was ready to sit back and enjoy his handy work. Two weeks ago we loaded up the pooches and headed to one of Edi & Tess’s Favorite Places – Mud Puppies. 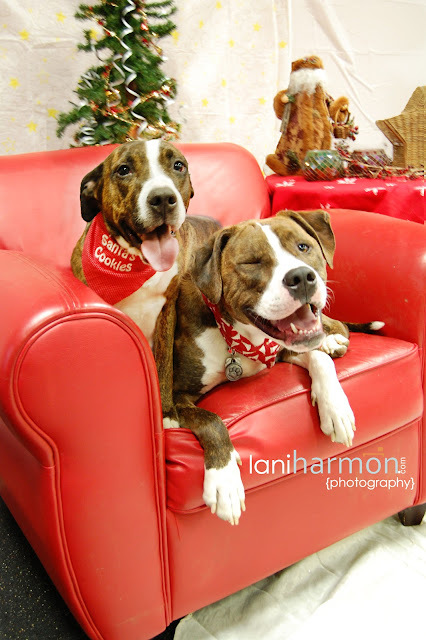 Last year, the owner Kim, had a photographer come in and do Christmas photos of the canine customers. I signed up thinking it’s a great way to support the shop, a local photographer, and get some cute photos of the pooches all at the same time. And while, yes, all three of these things were accomplished, it wasn’t as easy as it sounded. This was still in the “Crazy Ed” phase– and he was on top of his game that day. Not only was it a terrible experience (although we learned alot! ), it was really embarrassing. But we did get some cute photos! So we were excited this year to show off the progress we had made...and also a little nervous to see how Ed would do. I marvel at pitbull owners. Knowing the pitbull reputation, after having fallen in love with a certain brindle pitty, I began researching. I wanted to know every detail about this “breed” – the good, the bad, and the beautiful. I’ve come to find this is true about most pitbull owners. Since we find ourselves required to stick up for our pooches (for no wrongdoing of their own), we have to be overly prepared. This is why we have worked so hard in making sure our dogs are as close to perfect as possible and are always working to make them better. Why we got Tesla through CGC and are working our way there with Ed. 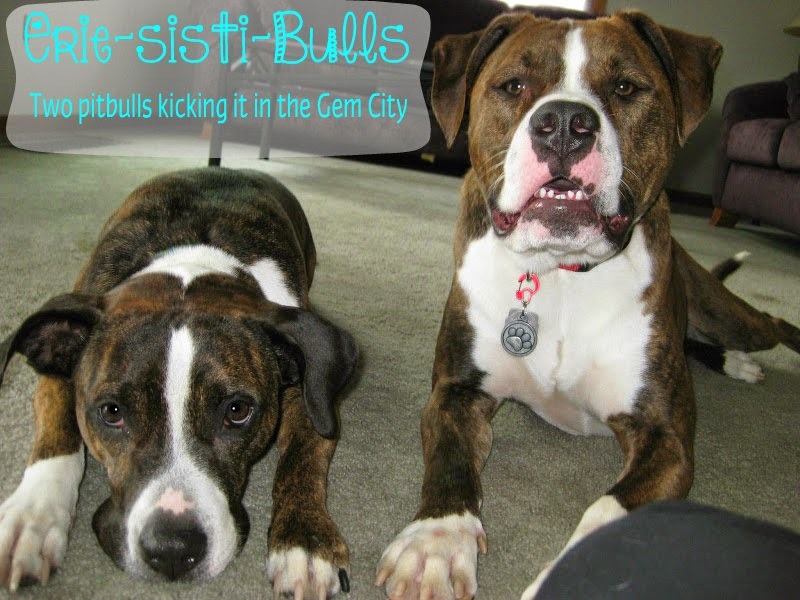 Why we know the history of the breeds identified as pitbulls. 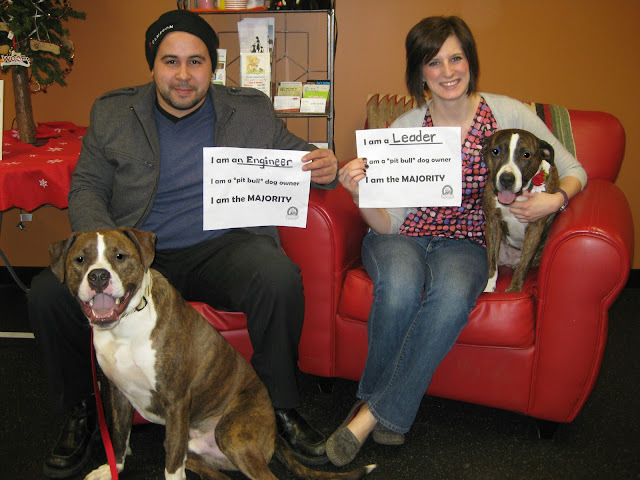 Pitbull owners make it their duty to be fully in-tune with their dogs, knowing their limits and stressors. They take it one step further and are aware of their surroundings – other dogs; kids; small, furry animals – and how their pooch will react to it. When I adopted Tesla, she was dog tolerant, but did not appreciate rude dogs – the overly friendly, in-your-face greeters (pitbull owners – you know exactly what I mean). So she would appropriately give them a correction. 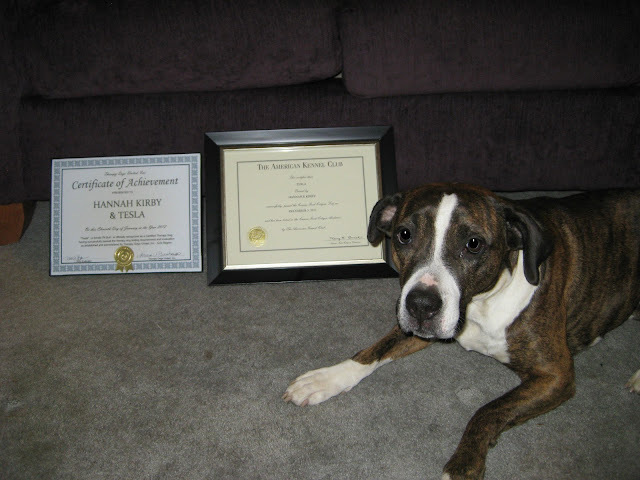 Although in the dog world, Tesla’s reaction is totally warranted, I feared that humans would not understand this and assume that she was dog intolerant or aggressive – because she is a pitbull. The Animal Farm Foundation has an initiative called “the Majority Project.” The aim of this project is to show that pitbull owners are everywhere. That they include all types of people, in all sorts of careers, of all different lifestyles, and the gamut of ages. That the majority of us are regular folks (with some pretty amazing pooches, if I might add). So here we are, being the majority. 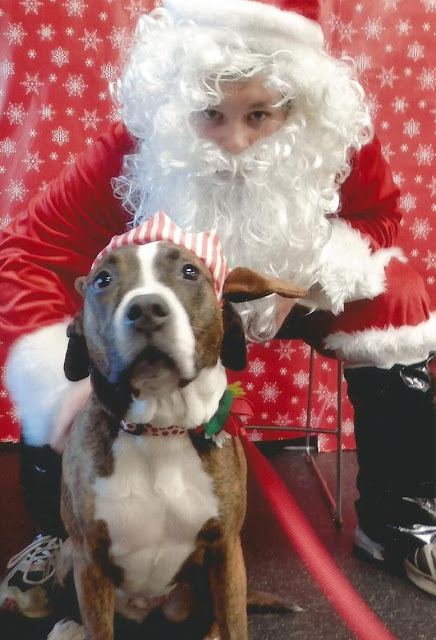 As we noted in our post earlier this week, there were ample opportunities to get your pooches' photo taken with Santa today. This morning, Tess and I were at Peninsula Pups Doggy Daycare representing Therapy Dogs United. Canine Santa (aka Therapy Dog Maxx) was even there to with all the pups a Merry Christmas. Newly therapy dog certified Google was there to show off the work he does with Northwest Pennsylvania K9 Search and Rescue. This lovely lady was visiting from the ANNA Shelter. Her name is Oriole and she is up for adoption!! She was super sweet and very friendly. Tess even made a new friend named Oliver. After that, Tess made her way to Mud Puppies for their 2 Year Anniversary Party and photos with Santa where we met up with Edison. Edison didn't care much for this pseudo-Santa, so he passed on the photo op. We did get a photo of Tess & Ed, sans Santa. We have had an incredibly hard time finding toys for Edison that last more than 15 minutes. And at over $20 a pop, that’s almost $2/minute. 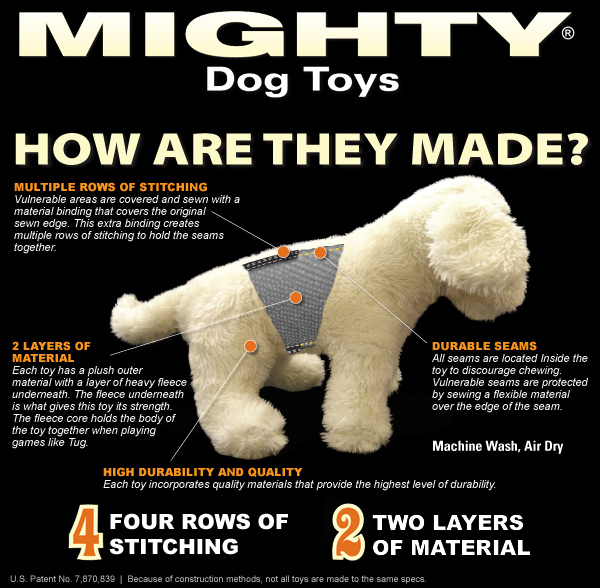 While searching for tough toys, I came across VIP Products, maker of Mighty Toys and Tuffy toys – which claim to be the “tuff”est soft dog toy. Needless to say, I was excited when I found out they had a toy tester program . By signing up for an agreed number of toys per year, you get discounts for rating the toy. And while Tess is indifferent to toys, Edi loves them. We were in. We got our first toy today: Mighty Toy’s Massive Piglet, aka Paisley. Upon receipt, the piggy was much bigger than I had expected (although, it is called “massive” so maybe that was my own lack of imagination). As he began to play with it, it seemed to be withstanding his attack. He didn't seem to be able to nibble at the seams as he usually does with other toys. However, as soon as Tess got in on the deal (she has no interest until someone else does), it was quickly lights out for the poor pig. The seam on the inside of her leg tore and her stuffing was next to go. Although I do want to teach Ed how to be more gentle with his toys and what is appropriate play, I also wanted to see what these toys were made of. Paisley will be headed to Stuffy Hospital for a few sutures and put back into action. Ed loved her. We can't wait for our next VIP Product! 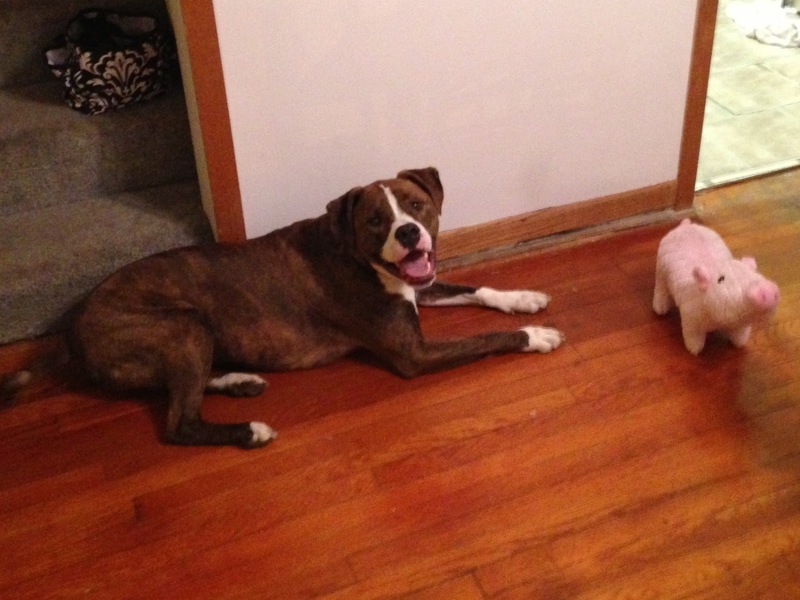 Overall, I think the Massive Piggy would have stood up to supervised play, but it was no match for dueling pitbulls.